,Meets in the Community Centre every Monday, including Bank Holidays, with session one at 17:30 and session two at 19:30. Hannah, the Slimming World Consultant, is on hand to provide you with all the advice and guidance you need. I'm having the best summer ever! 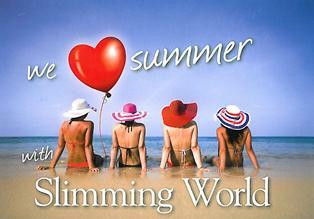 Thanks to Slimming World, I'm enjoying picnics, barbecues, days out - my holiday - two stones lighter! I'm soooo happy! Losing weight has been easier than I ever imagined! I've never eaten so much delicious, filling food. And with loads of support and encouragement from my local group every week, the extra pounds just disappeared. It really is true - with Food Optimising you never go hungry and you can enjoy all your favourite treats! We have a great time in group - I've made so many friends there - and I'm sure you'd love it too. It's just around the corner and there's a fab special offer on just now saving you £5. And when you sign up for 12 weeks you'll get two weeks free. I'm off to relax by the pool and the only thing I'll be covering my body in is sun tan lotion! Hope to see you at our group soon!